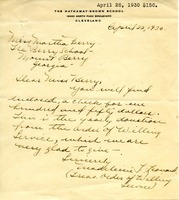 A letter detailing an enclosed amount of one hundred-fifty dollars to be given to the Berry Schools as a yearly donation from The Hathaway-Brown School. 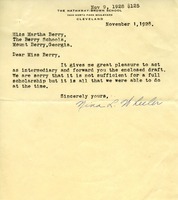 Nina Wheeler writes Martha Berry to inform her of a donation made to the Berry Schools. The girls at the Hathaway-Brown School send a check for $75 in response to the fire at Berry. They couldn't send more due to their own school fund for a new building. 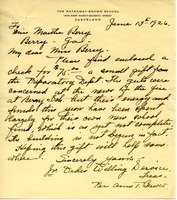 The letter and gift were sen by the school by the request of Anne T. Brewer.